When the call come in about a bunny who seemed to have an injured leg, nobody knew how much life was about to change at 10,000 Carrots Rescue! A woman had dropped a rabbit off (soon to be named Turnip) at the Cobequid Animal Hospital on August 30, 2013. 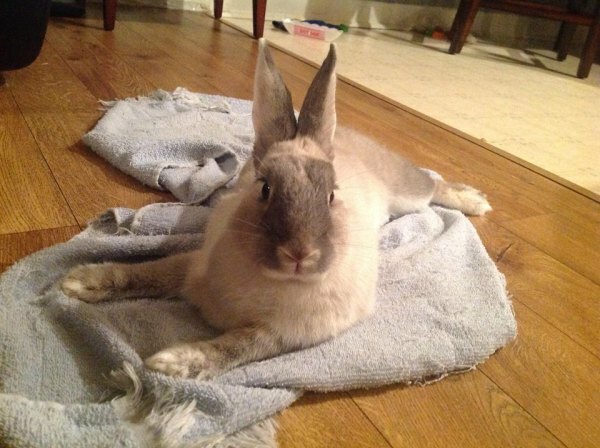 It is claimed that the rabbit was found in someone’s backyard with a bummed leg that was dragging behind her. Staff worked to remove over 60 ticks from her face alone - with more covering her body! Her underside was soaked from urine scald and the injured back leg was red and inflamed with infection. Lots of tests were done to determine why the leg was the way it was, the first bit of mystery behind this little bunny. No one could figure of why she couldn’t use the leg, but they did find out it was also affecting her hip. A difficult decision was made to amputate her leg as well as her hip. Without her hip, Turnip had to adjust to a new way of life but she did so the best way she knew how. She figured out how to balance herself but it twisted her little body in such a way it limited her mobility almost entirely. 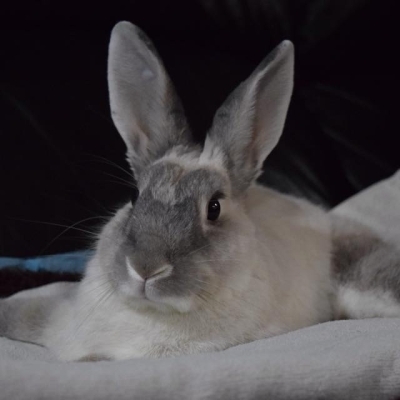 more time in the rescue than most of the other bunnies. In September of 2014, she made her television debut and accompanied Tammy and Lisa on CTV News! She was showing off her new wheels (the Rutabaga Roadster!) which would help aid in some physio for her in hopes of improved mobility. She also did a great job in helping them spread the word on proper bunny care and the importance of rescuing! 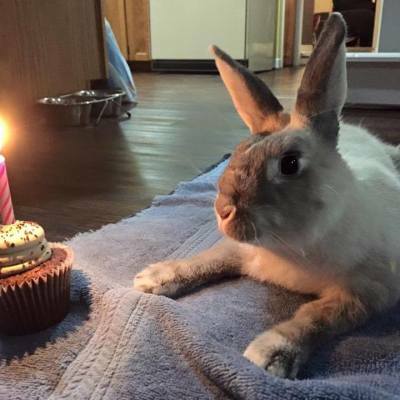 She may have taken her fifteen minutes of fame too far though as it is rumored that she started referring to herself as the “Rescue Spokes-bunny”. Hidden under that adorable face and beautiful eyelashes was the attitude of a Diva! She would continue to search for her forever home and in November 2016 she went on one last trial run. Toes were crossed that this would be it and as it turned out, it was! 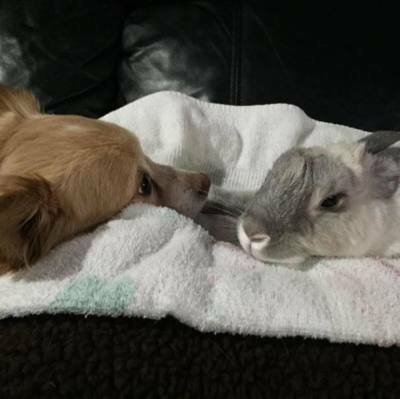 Turnip found herself part of a family with another bunny, a dog and two humans who adored here more than anything. She was less than impressed over the other rabbit, and we are sure that if she could have sent him packing, she would have. The dog, however, became her new best friend. By the next year and a bit, Turnip was completely settled in. 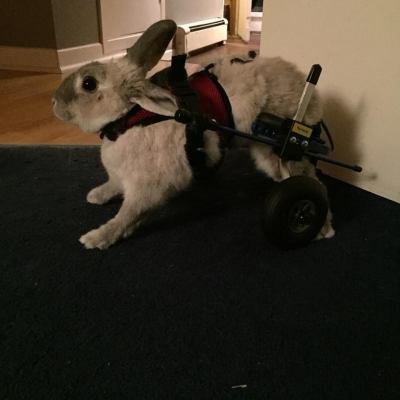 She worked her cart to gain some strength and one night after a lot of hard work she even managed to get two little hops! She had access to unlimited carrot tops, cuddled every night on the couch with her dog and was enjoying life. extra TLC and medical treatment from home. She recovered well and things went back to normal for a few short months. In the spring of 2016, life threw one last curve ball her way. Turnip started to act a little off, and it was soon discovered that she was starting to have seizures. One unfortunately bad one landed her in the hands of some very dear friends at the animal hospital once again. due to the severe seizure, she had lost her vision. Her quality of life had taken a turn for the worst, and the most dreaded decision had to be made. She went home for a short time, and on April 18 we let her find the pain free peace she deserved. Turnip’s actual age was never really know, but it adds to the wonderful mystery she carried with her. She overcame every obstacle that she faced and never lost the beautiful spark she had. Anyone who was lucky enough to see her, pet her or receive some sweet, sweet kisses is someone who is a part of a very lucky group of people. She had a one of a kind soul who changed the lives of everyone who got to have her in their lives. One can only hope that she truly understood how special she was and how life was so much better with her in it. It just hasn’t been the same without her. She was and always be the most remarkable little being wrapped up in a tiny, three-legged little bunny.